Adnan Farhan Abdul Latif, a Yemeni citizen and one of the first detainees sent to Guantánamo Bay, Cuba, in January 2002, died there earlier this month. There is no official autopsy report yet, but in his decade in prison he had gone on hunger strikes and made several suicide attempts. Adnan Latif, left, with Hussain Almerfedi, another Yemeni man imprisoned. THIS OF COURSE TAKES ON ADDED SIGNIFICANCE WITH THE DEATH OF ADNAN LATIF. STEPHEN BIKO- DEAD ON SEPTEMBER 12, 1977. Adnan Latif's death in U.S. custody at Guantanamo is a tragedy. It could have been avoided. Adnan spent more than ten years in Guantanamo – nearly a third of his life – but, like most Guantanamo detainees, he was never charged with a crime or accused of violating any law. Adnan was slightly built and gentle, a husband and a father. He was a talented poet, and devoutly religious. The Administration cleared him for transfer back in 2009, but he was a Yemeni, and the Obama Administration will not send Yemenis home – even if, like Adnan, they have been cleared for transfer by a unanimous decision of all responsible agencies after a comprehensive review of the evidence. Because Adnan was from Yemen, he remained imprisoned for three more years after being cleared – not for anything he supposedly did, but simply because of where he came from. More tragic ironies abound. In 2010, a federal judge ruled that he should be released, but a divided appeals court overturned that ruling in a widely criticized decision a year later. Three months ago, the Supreme Court declined to restore the ruling, and instead let his case go back to district court for a new hearing that, sadly, will now never occur. Amnesty International was about to launch a new worldwide campaign on his behalf. Adnan consistently denied the government’s claims and maintained his innocence. He said that he was in Afghanistan when the United States began bombing in October 2001 because he was seeking free medical treatment for injuries he had suffered in a car accident as a teenager. Fleeing Afghanistan, Adnan was captured and brought to Guantanamo, and held on claims that he was part of the Taliban. He was among the first detainees to arrive in January 2002. The military and the Administration cleared him for transfer, yet fought in court to keep him imprisoned. Adnan endured great suffering at Guantanamo – physical and spiritual – and lived in constant torment. He complained of physical pain, impaired hearing and vision, untreated rashes, open sores, and unexplained bruises. He protested what he saw as the injustice of his confinement by hunger striking and injuring himself. He became mentally fragile and was at times sedated, placed on suicide watch, and sent to the prison’s psychological unit. Adnan spent more than ten years in a foreign land separated from his family, his loved ones, and his home. He was charged with no crimes. He was cleared for transfer because the government did not believe his detention was necessary for our national security. Yet he could see no end to his confinement. 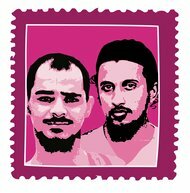 However he died, Adnan’s death is a reminder of the injustice of Guantanamo, and the urgency of closing the prison. May this unnecessary tragedy spur the government to release the detainees it does not intend to prosecute. RIP ADNAN- I'M SORRY NO ONE WAS ABLE TO RESCUE YOU. Lyle Denniston has more here.